If you have a mother like no other don’t forget to treat her on her special day – Mother’s Day – which falls on 6th March this year. Whether you’re spoiling her rotten with a really indulgent gift or looking for something small that says a lot, The Liberty Shopping Centre has a whole range of gift ideas from more than 100 stores, to suit all budgets and be guaranteed to make her day. 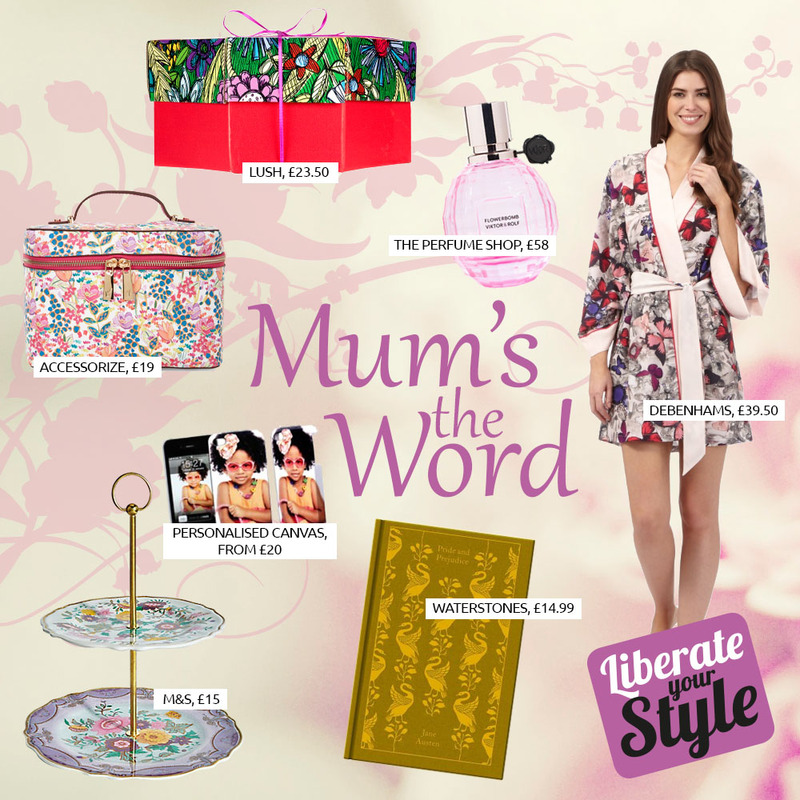 If, after reading our blog you are still stuck for gifting ideas, why not visit us on Facebook and tell us the best piece of advice your mum has given you, using the hashtag #DearMum, for a chance to win a mother and daughter pamper package from Lush in The Liberty, Romford? If something sweet is just mum’s cup of tea, why not give her a tasty token of your affection by serving up some delicious homemade treats on this elegant Spring Bloom Melamine 2-tier Cake Stand, £15 from M&S. Rather than a bouquet, why not give her something that smells just as sweet but will last a little longer. This beautiful limited edition summer scent from Viktor and Rolf, ‘Flower Bomb La Vie En Rose’ £58 from The Perfume Shop, will treat her senses with top notes of grapefruit, mandarin, pepper and tea. Wrap her up in this stunning dressing gown from the B by Ted Baker range, £39.50 from Debenhams. Designed in a classic kimono style, it features a bright all over butterfly print, contrasting trim and a self-tie waist and will make a colourful addition to any loungewear collection. Part of Penguin’s beautiful hardback ‘Clothbound Classics’ series, designed by the award-winning Coralie Bickford-Smith, these delectable and collectible editions are bound in high-quality colourful, tactile cloth with foil stamped into the design. Start mum’s collection with Jane Austin’s classic, Pride and Prejudice, £14.99 from Waterstones. Five fabulously pampering soaks await the mum who opens up this pretty package, ‘Just For Mum’ £23.50 from Lush. Intergalactic and Twilight bombs will help her feel out of this world, grounding Guardians Of The Forest and Yoga Bomb will bring her gently back down to earth, and luxurious rose Bombshell is filled with yellow rose petals for a blissful, floral experience. Printed with pretty summer flowers, this zipped Vanity Case, £19 from Accessorize, has plenty of space to store all her favourite make-up and toiletries and makes the perfect weekend away carry case if you’re really blowing the budget and sending her away too! Create a totally unique gift by transforming her favourite family photo into an iPhone or iPad case, £20 from Personalised Canvas, so she can keep her nearest and dearest with her all day, every day.